Photo: © Caroline Schaer (UNEP DTU Partnership). From page 7 of the report. The adoption of the Paris Agreement at the twenty-first session of the Conference of the Parties (CoP21) to the UN Framework Convention on Climate Change in November 2015 was a landmark achievement, with195 countries endorsing an ambitious climate change agreement that includes a global goal on adaptation. More robust information on adaptation needs, costs, and finance is needed to guide and inform the successful implementation of the Paris Agreement. 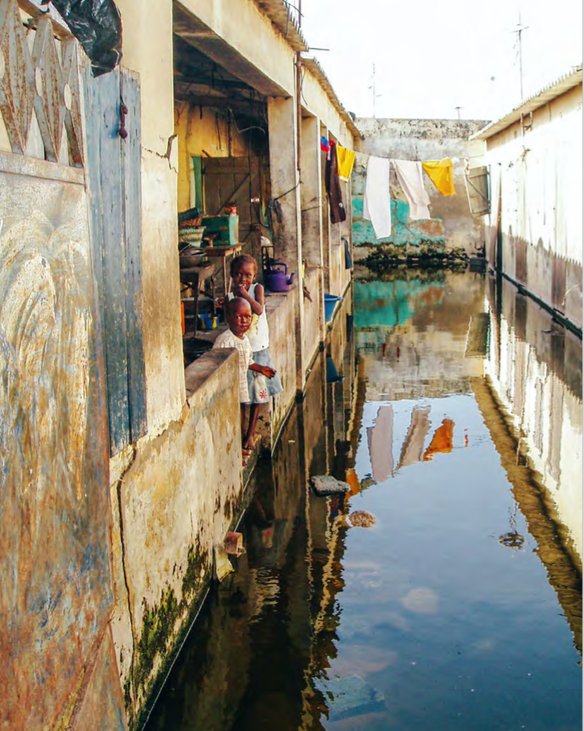 To support the provision of such information, the 2016 Adaptation Finance Gap Report presents an indicative assessment of the current knowledge on global adaptation costs, the finance available to meet these costs, and the anticipated difference between these two figures – the adaptation finance gap. The report* builds on a 2014 assessment by the United Nations Environment Programme, which laid out the concept of adaptation gaps and outlined three such gaps: technology, finance and knowledge. Like the 2014 report, the 2016 report focuses on developing countries, where adaptation capacity is often the lowest and needs are the highest, and concentrates on the period up to 2050, as the short to medium term is considered the most relevant for decision-making related to adaptation. The report highlights trends and challenges associated with measuring progress towards bridging the adaptation finance gap, while informing national and international efforts to advance adaptation. It analyses adaptation finance against the background of the provisions laid out in the Paris Agreement, and benefits from the insights included in the NDCs. Chapters focus on the costs of adaptation, adaptation finance (including an overview and current finance levels, trends and tracking activities), private sector finance for adaptation, and the adaptation finance gap and prospects for bridging it. *Download the full report from the right-hand column. The key messages from the report, based on the Executive Summary, are summarised below. See the full text for much more detail. Work in this report confirms and reinforces the findings presented in the 2014 report: the costs of adaptation are likely to be two- to-three times higher than current global estimates by 2030, and potentially four-to-five times higher by 2050. The national and sector literature surveyed in this report indicates that the costs of adaptation could range from US$140 billion to US$300 billion by 2030, and between US$280 billion and US$500 billion by 2050. This literature highlights that assumptions have a strong influence on the cost estimates, and that studies that focus on policy implementation and national circumstances generally report higher adaptation costs. The costs of adaptation in developing countries are increasing, strengthening the case for immediate and enhanced mitigation action. Global, national and sector studies show that adaptation costs increase under higher emissions scenarios. This reinforces the notion that deep mitigation actions are the best insurance against rapidly rising adaptation costs and the potential limits of adaptation. Improved estimates of the costs of adaptation require more and better-designed studies to be conducted. Additional empirical studies are especially needed for sectors or risks that are currently understudied, notably biodiversity and ecosystem services. Testing how the choice of method and assumptions affect cost estimates, possibly through sensitivity testing and multi-model analysis, is equally important. Total bilateral and multilateral finance for climate change adaptation reached US$25 billion in 2014, of which US$22.5 billion targeted developing countries, highlighting a steady rise over the past five years. Most funds originate from development finance institutions (US$21 billion, or 84% of the total) and are delivered through low-cost or market-rate project debt (53% and 26% of the total, respectively). Developing countries in East Asia and the Pacific attract almost half of the funding (some 46% of the total). Over half of the total finance (55%) is directed to water and wastewater management projects. Dedicated climate funds help break down barriers to investment in adaptation projects in developing countries and play an important role in catalysing a wide range of adaptation-related investments. They do this by strengthening the capacities of local stakeholders, creating incentives for institutions and investors (for example, by offering concessional terms) and, ultimately, by taking on risks from which commercial financiers will typically shy away. The US$1.2 billion Pilot Programme for Climate Resilience and the almost US$1 billion Least-developed Countries Fund are the largest adaptation-targeted funds. Yet developed-country contributions to these funds are low when compared to contributions to mitigation-focused funds. The Green Climate Fund, which recently entered into operation, is expected to play a significant role in financing adaptation, as it seeks to reach an equal split between adaptation and mitigation. By the end of 2015, just over US$35 billion, corresponding to 76% of the resources pledged to adaptation-focused climate funds, had been approved for disbursement. The trend for the period 2011-2015 is one of growth, and includes the approval of the Green Climate Fund’s first eight projects, four of which are adaptation projects. Some of the poorest countries in sub-Saharan African, and South Asia have been the main recipients of funding for adaptation from dedicated climate funds. Small-island developing states are among the main recipients of adaptation finance for disaster risk reduction. Improved tracking of, and reporting on, financial flows has the potential to increase the efficiency with which international adaptation finance is used. In recent years, a number of steps have been taken to this end: in February 2016 an improved definition of the OECD Rio Marker for tracking bilateral official development assistance targeting adaptation was adopted, and in early 2015, six large multilateral development banks and the International Development Finance Club agreed on a set of common principles for tracking climate finance. Climate-resilience activities are often integrated into development interventions or business activities, and therefore rarely stand-alone. For this reason, private sector adaptation-related investments are difficult to identify and classify, which results in data gaps and difficulties in measuring and reporting private financial flows persist. Beyond management of its own exposure to climate risks, different kinds of private finance – debt, equity, insurance products – hold potential for helping to bridge the adaptation finance gap. Improving our understanding of private sector financing for adaptation is key to unleash this potential. Outside of adaptation, private sector contributions (including foreign direct investment, private debt, remittances and official development assistance) make-up the largest components of financial inflows to developing countries. The distribution of flows is uneven, with least-developed countries struggling to attract significant volumes of private debt or equity outside resource sectors. Private domestic investment levels are rising in developing countries and, if this trend holds true for micro- and small- sized enterprises, a portion of those funds is likely to be spent on adaptation-relevant activities, particularly for those enterprises active in agriculture, a sector that is especially sensitive to climate change. Remittances are currently around 3.5 times larger than the total flows of official development assistance, and play a major role in developing country economies, for individual households, and for small businesses and entrepreneurs. Remittances may be valuable from an adaptation perspective because they tend to increase in cases of catastrophic weather events and natural disasters in migrants’ countries of origin. They also reach households directly, including those in remote and vulnerable areas, more rapidly than public finance flows. Generic barriers to private sector investment in developing countries are well known, and include poor legal, economic and regulatory frameworks, immature financial markets, and currency exchange risks. These barriers obstruct private sector adaptation to climate change. Adding to these are barriers that are specific to climate change, such as the cost-saving nature of adaptation investment, which contrasts with the revenue-creation motivation of the private sector, or various social and cultural barriers. Domestic government agencies and development institutions can help break down barriers to private sector adaptation by undertaking targeted financial and non-financial interventions. Strengthening the ability of development banks to mobilise private sector investment is the financial intervention that has been used most. Key non-financial interventions include improving the provision of data and information, and introducing policies that are conducive to private sector investment, notably economic inducements. Today, developing countries already face an adaptation finance gap. This gap is large and likely to grow substantially over the coming decades, unless significant progress is made to secure new and additional finance for adaptation, and to put into effect ambitious mitigation measures. Adaptation finance flows have increased in recent years, but current finance levels fall short of present-day adaptation costs and are likely to do so in the future. Current adaptation costs are likely to be at least 2 to 3 times higher than international public finance for adaptation. Looking forward to 2030, adaptation costs in the period around 2030 are likely to be in the range of US$140-300 billion per annum, whereas international public finance for adaptation in 2014 was around US$22.5 billion. While the two figures are for different points in time and differ in terms of definition and coverage, they illustrate that, to meet finance needs and avoid an adaptation gap, the total finance for adaptation in 2030 would have to be approximately 6 to 13 times greater than international public finance today. Moreover, the potential adaptation finance gap in 2050 would be much larger – in the order of between twelve-to-twenty-two times current flows of international public adaptation finance. Integrated assessment model estimates of the costs of adaptation globally suggest that costs could be even higher than the estimates produced in the context of national and sector studies. Furthermore, model estimates illustrate the emissions-dependency of adaptation costs, and highlight that adaptation cost levels for different warming scenarios could diverge as early as the 2030s. It follows that enhanced mitigation ambition and pre-2020 action is central for limiting adaptation costs. Scaling up both public and private sources of finance is required to bridge the adaptation finance gap, now and in the future. Current estimates of adaptation finance flows are partial, as data limitations and methodological challenges prevent the inclusion of private sector and domestic public finance flows for adaptation. However, exclusion of these flows is unlikely to change the conclusions regarding short- and medium-term adaptation finance gaps. The Paris Agreement restated the 2020 commitment by developed country parties of mobilizing US$100 billion per year for adaptation and mitigation until 2025, and requires parties to increase that commitment after 2025. Assuming an equal allocation of finance between adaptation and mitigation (as called for in the Paris Agreement), this commitment could go a long way toward bridging the adaptation finance gap. The Paris Agreement and its implementation offer opportunities for significantly bolstering progress. The Paris Agreement recognises that adaptation is a global challenge with multifaceted local, subnational, national, regional and international dimensions and provides a framework for enhancing global and national adaptation action. Implementation of the methodological provisions in the Paris Agreement would address many of the challenges identified in this report with regard to estimating adaptation costs, and (tracking and) mobilising additional financial flows for adaptation, including from the private sector. The Nationally Determined Contributions (NDCs) represent a valuable starting point for such efforts, and the adaptation components in the NDCs indicate that current costs exceed current finance levels. Furthermore, the NDCs illustrate that there are similarities between the types of climate risks and adaptation responses that communities, sectors, countries and regions are facing, and provide a stepping stone for framing clearer goals, targets and metrics for adaptation, which can help set the direction for adaptation action and facilitate tracking progress. Photo: © Asian Development Bank . From page 4 of the report.